THESE PRODUCTS ARE NOT AVAILABLE FOR RETAIL SALE BUT ARE SUPPLIED TO COMMERCIAL MANUFACTURERS ON PRE-AGREED TERMS. ENQUIRIES WELCOME BY PHONE OR EMAIL. For over 50 years W.G. Ball Ltd have been involved in the manufacture and supply of colouring oxides to the vitreous enamel industry. We are familiar with most vitreous enamel frit manufacturers’ products. 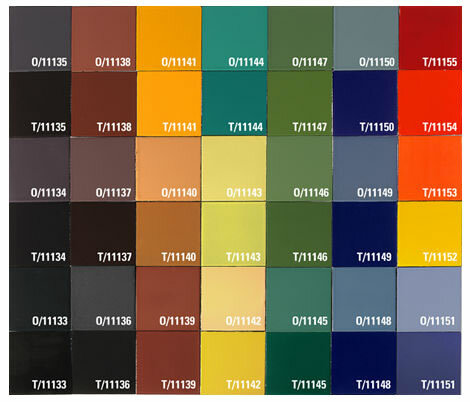 Colours can be formulated either to customers’ unique ideas, or, to Ral, Pantone, NCS, etc., references. We have a confidential matching service available for new and existing customers. What metals can I enamel? Comments Off on What metals can I enamel? Why has the enamel crawled in from the edges? Comments Off on Why has the enamel crawled in from the edges? Why is there a rippled surface on the enamel? Comments Off on Why is there a rippled surface on the enamel? Why are opaque red, yellow and orange enamel full of black spots and lacking in colour? Comments Off on Why are opaque red, yellow and orange enamel full of black spots and lacking in colour? Why does the enamel crack when cool? Comments Off on Why does the enamel crack when cool?